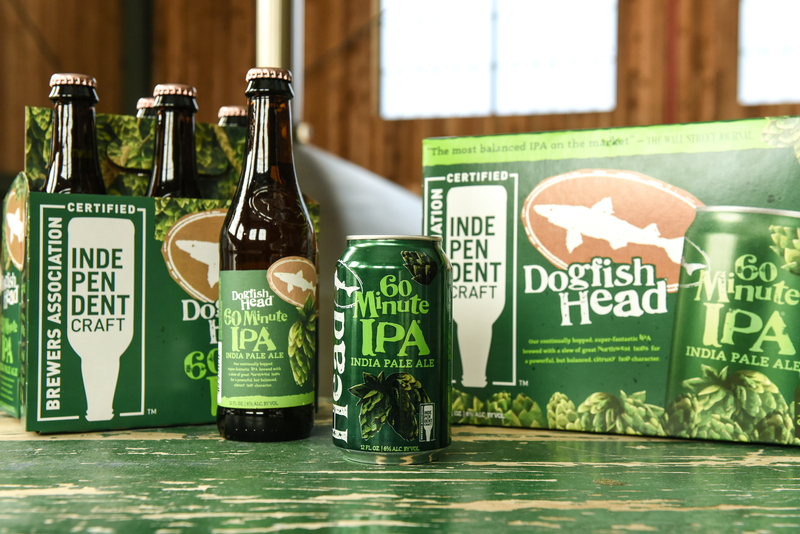 New 60 Minute IPA packaging amplifies independence! There has never been a more exciting moment than RIGHT NOW to be a beer drinker or beer maker in America. With over 7,000 indie American breweries operating today, the average American now lives within nine miles of a brewery … that’s incredible! But with that, there has never been a more challenging moment to be an indie craft brewer. As ubiquitous as craft beer may seem to the average craft beer fan, we still live in a world where two foreign-owned conglomerates control the vast majority of our country’s beer market. At Dogfish Head, we believe beer-loving consumers deserve to know who really makes the beers they are drinking, which is why we have championed the Brewers Association’s Independent Craft Brewers Seal since it first launched in 2017. We have the seal on both our beer packaging and the entrance door at each of our coastal Delaware locations. We talk about the seal and its meaning to the hundreds of thousands of beer drinkers who tour and visit our restaurants, inn and brewery every year, and it warms my heart to see that over 4,000 indie craft breweries have adopted the seal alongside us. Along with all of the goodness that comes with 7,000+ breweries making so many beautiful beers, also comes a concerning lack of transparency and authenticity in the ways certain large brewing mega-corps market the beers they own / make / control, but present as if they are still coming from small indie American breweries. This is why we have decided to make the Brewers Association’s Independent Craft Brewers Seal as big as we possibly can on our biggest selling beer’s package - 60 Minute IPA. Any time there is a line drawn in the sand, there are going to be some folks who are not happy to be on one side of that line or the other. There are great people brewing great beers on both sides of the indie craft line, but we believe consumers deserve to know who makes the beer they think is coming from an indie craft brewery at the point of purchase. We are using our 60 Minute package as a soapbox on which we stand to amplify the dialogue and the expectation that brewers large and small be as transparent and authentic as possible with their marketing and packaging. Through direct interaction at our properties and social media, our experience at Dogfish is that there are a lot of consumers that have a strong desire to understand who is really making their beer. That’s a beautiful thing. We also recognize that there are some beer drinkers who don’t give a sh!t about who makes their beer, and that too is a beautiful thing. Ultimately the freedom of choice is in the consumer’s hand, and we believe the consumer should be armed with the facts before they make that choice. Once they have the facts and know which beers come from indie American craft breweries and which ones don’t, then the choice is all theirs. I believe the vast majority of Dogfish drinkers will support our decision to amplify the shield and its message on our 60 Minute packaging. I believe this because I have had conversations with lots of beer fans - on the road at events and festivals, in our restaurants and other great establishments, and around the fire pit at our harbor-front Dogfish Inn. I also believe that not everyone who drinks Dogfish will care about this decision to lean into the seal. We understand that and we are good with that too. We look forward to digesting any feedback or comments you may want to share, and we hope you digest a pint (or two) of 60 Minute with friends and family.